Every girl has the right to live a life free from violence, discrimination, intimidation and abuse. Today, however, violence denies this right to millions of girls around the world and continues to be one of the most persistent, systematic and widespread human rights violations. To put an end to this violence and in celebration of the International Day of the Girl Child on 11 October, today we launch The Light of Girls programme“to raise awareness about the inequality girls experience, protect them from violence, empower them to choose their future and advocate to transform the causes of gender-based injustice”, according to Raquel Martín, our Director of Communications and Institutional Development. “We want their light to shine. Girls have the right to a childhood with equal opportunities, free from fear, threats and aggression. Education can defend them, protect their rights, transform their lives”, said Martín at the campaign launch event. Daniel Villanueva, Vice President of the Entreculturas Foundation, explained that “violence today denies millions of girls worldwide the right to an education: it continues to be one of the most persistent, systematic and widespread human rights violations. These aren’t simply anecdotes: violence threatens the lives of 240 million girls and over 200 million girls worldwide are victims of genital mutilation. Twelve million girls under the age of 18 are married every year. More than 150 million experience sexual violence. And 34.2 million girls and women are refugees or have been displaced from their homes”. The majority of the world’s girls are forced to do housework like cooking, fetching firewood or water and caring for younger siblings. These forms of violence against girls have serious psychological, physical and social impacts that leave an indelible mark, ripping away girls’ education, childhood and opportunities. Two women who fight violence against girls in Guatemala and Chad gave their testimonies as evidence of these contexts of gender-based injustice. The first was Sifa Kaite, Child Protection Coordinator at the Jesuit Refugee Service in Chad. Her work is tied to the “innumerable” forms of violence that refugee girls face in refugee camps, with a focus on “female genital mutilation (FGM), forced marriage, early marriage, housework, school dropout ratesand sexual violence”. All these forms of violence are serious violations of girls’ human rights, destroying their self-esteem and hindering development and continuity of learning. “Violence against girls”, says Sifa, “keeps them from enjoying and exercising their human rights, including the right to education, the right to play, the right to health and the right to express one’s opinion”. To transform this reality, Entreculturas and the Jesuit Refugee Service provides a series of prevention and response services through The Light of Girls programme. “School teachers provide ongoing prevention activities, advocacy, educational talks, awareness-raising, creation of a girls’ club to distribute information on menstruation, HIV and AIDS, prevention of early pregnancy and distribution of hygiene kits”, says Sifa. “The girls want to know if what they are experiencing is happening elsewhere. They want to not have to worry, to know that they aren’t the only ones experiencing these challenges”. Sofía Gutiérrez, Head of Public Initiatives at Fe y Alegría Guatemala, knows the reality experienced by girls in her country, deeply impacted by high rates of sexual violence, early pregnancies and child marriages, which are more prevalent among the indigenous population. Last year, over 4,000 girls and adolescents in Guatemala were treated for violence and sexual abuse. There are also high rates of various forms of gender-based discrimination, which means that girls are largely responsible for domestic tasks, in many cases making it difficult for them to stay in school and access higher education, in turnmaking it impossible for them to join the labour force in the same conditions as their male counterparts. “The efforts of The Light of Girls in Guatemala focuses on preventing violence and creating safe spaces for girls in schools, where they can feel confident to speak, boosting their self-esteem on the one hand and making it possible for any situations of violence to be detected in time on the other, as well as provide psychosocial support”. Gemma López, head of Entreculturas’ Latin America and Caribbean Department, presented the objectives of The Light of Girls programme, which are to “raise awareness about the inequality girls experience, protect them from violence and continue to strengthen protection mechanisms, empower them to choose their futureand advocate to transform the causes of gender-based injustice”. She also spoke about the report that Entreculturas will publish along with the campaign; titled “An end to violence against girls: right to education, guarantee of equality”, the report analyses the concept of violence and its root causes. Girls must be able to find support in public protection systems: this implies strengthening coordination among institutions that work in sectors from education and health to child protection and justice. The obstacles that block girls’ access to education must be eliminated by allocating sufficient funds and applying incentives and scholarships. Ensuring that girls who experience multiple disadvantages –because they live in remote or conflictive areas, belong to a minority group, have some type of functional diversity, or are already teenage wives or mothers– have access to a quality education that inspires, educates and offers opportunities for girls to turn their life goals into reality, is particularly relevant. The challenge doesn’t end inside the classroom and we must ensure that the education offered includes lessons on gender equality. Both States and educational communities must work to transform schools into protective and safe spaces, which implies inclusive and adequate school infrastructures that serve the specific needs of young girls and promote discussion and awareness in the school community about unequal gender norms that perpetuate violence against girls as a way to critically examine and thus transform these issues. Schools must also create programmes that prevent, detect and act in all cases of violence, increasing girls’ confidence in these systems and protecting them from victim-blaming and even stigma. The teaching staff must be trained in gender equality and in the prevention and detection of violence against girls. 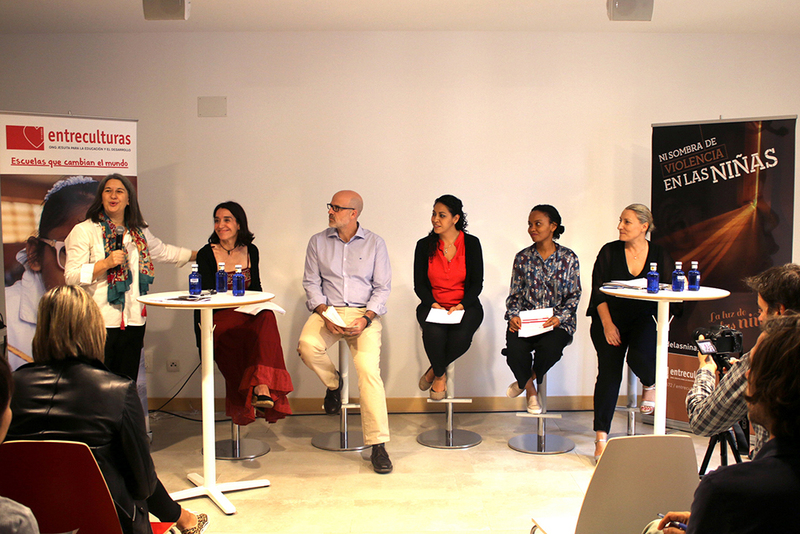 Gemma also explained that “since 2012, Entreculturas has made a difference in 15 countries through its The Light of Girls programme, opening up opportunities for girls’ lights to shine”. A total of 2,747 girls in 15 countries (DR Congo, Central African Republic, South Sudan, Chad, Kenya, Guatemala, Nicaragua, Haiti, El Salvador, Honduras, Peru, Bolivia, Cameroon, Angola and Sudan) have been helped since the creation of The Light of Girls programme in 2012. Today, in 2018, 12,700 girls from 11 countries (DR Congo, Central African Republic, South Sudan, Chad, Kenya, Guatemala, Nicaragua, Haiti, El Salvador, Honduras and Peru) participate in the programme”. The programme focuses on three priority areas –promoting girls’ access to and attendance of school; preventing, detecting, responding to and reporting violence against girls; and offering psychological and social rehabilitation to girls who are victims of violence, boosting their self-esteem and providing training and integration activities. To make this transition towards a more equal society possible, individuals, organisations, schools and communities have the duty to break their silence in the face of violence against girls and guarantee their access to justice, as well as to develop, share and identify ways that girls’ rights can be protected and restored. The most effective way to fight violence against girls is to make structural changes by deconstructing the social attitudes and norms that sustain violence and discrimination. Thus can we denaturalise all forms of violence and discrimination against girls and women by transforming the power relationships between men and women and boys and girls from their current status to a respectful model of fair treatment, based on a mutual recognition of the equality and freedom of all human beings.